Living History Education students during The Normal Heart residency (2013). 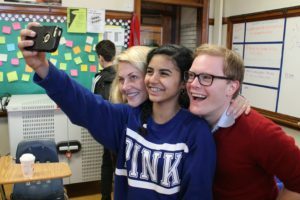 Founded in 2006, TimeLine Theatre Company’s Living History Education Program brings TimeLine’s mission to Chicago Public Schools, working with students on creative exercises related to historically inspired stories on TimeLine’s stage and elsewhere in literature. Living History is an arts integration residency that is closely in tune with the mission of TimeLine. The curriculum is designed to teach theatre skills while fostering the capacity to think creatively, to make connections, and to provide new ways of understanding history and the world around us. 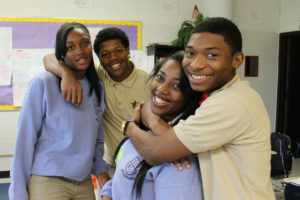 Over six to 13 sessions, students explore connections between history, art and their own lives, developing critical thinking and communication skills. Since its inception, more than 5,600 students have actively explored history through Living History. TimeLine currently partners with nine schools to present the program. Major supporters of Living History include The Crown Family, JoAnne Dobrick, Joseph & Bessie Feinberg Foundation, Lloyd A. Fry Foundation, John and Jessica Fullerton, Michael and Mona Heath, Japanese Chamber of Commerce and Industry of Chicago, A.L. and Jennie L. Luria Foundation, Robert and Eleanor Meyers, Polk Bros. Foundation, and multiple anonymous contributors, as well as the donors to TimeLine’s Annual Fund and Step Into Time gala. Actors and TimeLine Associate Artists Danica Monroe (left) and Alex Weisman (right) take pictures during the My Name is Asher Lev residency. TimeLine Theatre’s mission has always had an educational component, evident in our Backstory magazine, production study guides, dramaturgical lobby displays, Sunday Scholars Series and post-show discussions, driven by TimeLine’s belief that live performance can intimately connect people and illuminate ideas. Adding to those programs, after several years of planning and discussion, TimeLine launched the Living History Education Program in the fall of 2006 with a pilot program in the history department of Carl Schurz High School. During Living History residencies, TimeLine teaching artists and classroom teachers collaborate on lesson plans that illuminate the themes of the play and their connection to each classroom curriculum. Students work on several scenes from a TimeLine production and are provided with a study guide. They experience visits from the production’s actors and dramaturg and attend a student matinee of the play that includes a post-show discussion with the cast. Through TimeLine’s program, students can become engaged in exploring connections between history, art and their own lives. Working on a dramatic text opened my eyes … I now view with questions rather than opinions. It made me feel that I was part of that moment in history. As if I was experiencing it firsthand. It made me understand it better. It made me more curious about the world. History isn’t just the past, it’s the present also because the things we did in the past follow us throughout the present. The critical thinking that students display in these reflections indicates that TimeLine’s mission is relevant and vital for our next generation of leaders, artists and thinkers. If you would like further information about the Living History Education Program, please contact Program Director Juliet Hart at juliet@timelinetheatre.com. Watch this video to hear from students about their experience with TimeLine's Living History Education Program. Video design by TimeLine Associate Artist Andrew Carter. Special thanks to Robert Meyers for video footage. Learn more about the type of work our TimeLine teaching artists are doing in and out of the classroom! 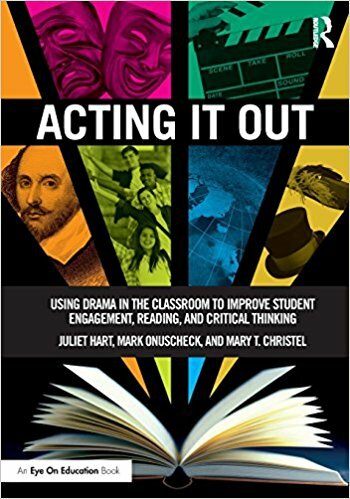 Living History Program Director and TimeLine Company Member Juliet Hart, who along with her collaborators Mark Onuscheck and Mary Christel, wrote Acting it Out, a guide to using drama in the classroom. Copies are available at the TimeLine box office or online here. Pick up yours today!